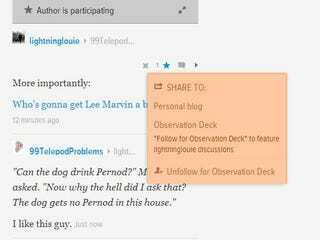 "Follow for Observation Deck" to feature lightninglouie discussions. Does this mean if I unfollow Louie he will no longer appear on the ODeck relative to me? Is this the long awaited feature where you can edit those authors you don't care for completely out of your reality? Or has it always said that?